It’s perhaps a little hard to believe in 2015, during an historic drought, but scattered across Bakersfield are hundreds of homes still missing one crucial suburban accessory: a water meter. State legislation mandates all customers be on metered service by 2025. City of Bakersfield customers, roughly one-third of residents mostly in the southwest, are all already on meters, as are water users served by East Niles Community Services District in eastern parts of the city. But crews from the California Water Service Co., Bakersfield’s largest water company, and two smaller providers, Vaughn Water Co., and Oildale Mutual Water Co., are regularly at work installing meters and prepping for installation. The process can typically cost companies anywhere from $600 to $1,000 per meter. But it can sometimes save customers money if they use less water than they were being billed for on a flat rate, and as California grapples with a fourth year of historic drought, representatives of all local water agencies agree metering is a vital tool for determining how much water is being consumed. “That’s one of the first things, if you’re going to manage your water use you’ve got to be able to measure it. That goes for the water company but that also goes for the customer,” said Van Grayer, general manager for Vaughn. Vaughn, which serves Rosedale, is ahead of Cal Water and Oildale in the race to install meters. All but about 600 of its 10,400 connections are metered, or about 94 percent, and crews are converting more than 50 flat-rate accounts to meters every year. Oildale Mutual, which serves Oildale, serves only around 10,000 total connections, but 5,000 don’t have meters. Douglas Nunneley, its general manager, said the company is still completing a state grant application that will bring in $400,000 to offset the cost of installations. Crews are prepping connections for new meters but are holding off on actual installations until they get the grant. These numbers pale in comparison to Cal Water, which serves two-thirds of Bakersfield — essentially everything except part of the southwest. Around 19,127 of its 70,000 residential connections are still without meters, so the company has doubled installations from 2,600 a year to 5,200. “It was going to be a 20-year program so that we didn’t burden our ratepayers but because of the drought we’ve had to shorten it,” said District Manager Rudy Valles, who estimates everyone will have meters in about four years. Nunneley questions whether residents will see a savings when their water lines are converted from flat rate to metered, and Valles acknowledges this won’t always happen. Valles said residents sometimes experience sticker shock when they see exactly how much water they’re using and what that will cost, so Cal Water keeps them on flat-rate pricing for at least three months after their meter is installed, so they can monitor their own water usage. After that grace period is up, residents will be given a water budget based on a 2014 month-over-month average of the residential usage for the entire Cal Water Bakersfield service area. Oildale Mutual is also contemplating giving residents time to adjust their usage once it starts installing meters. But Cal Water construction superintendent Mary Fletcher said residents still aren’t thrilled to learn by door-hanger and letter that they’ll be getting a water meter. Crews from Cal Water and its subcontractor, West Valley Construction Co., sometimes have to contend with unhappy residents, locked gates and unfriendly dogs, but on Friday it was business as usual in Hillcrest. Workers removed a familiar “water meter” cover at a home in the 2500 block of Elton Street, then dug down about two feet to expose the pipe on both sides of the company’s brass shut-off valve. Working slowly but carefully, the pair turned off the house’s water, cut the pipe, then carefully screwed on new metal pipe with a meter, gluing PVC together on the other side to reconnect to the resident’s water line. Foreman Jose Uribe took a few minutes to walk the neighborhood, lifting another “meter cover” on a neighboring house that would be probably be next to get a meter. The cockroaches that scurried away bothered him less than black widow spiders, Uribe said, kicking dirt across the street to show a reporter a meter cover that had been buried. “After a while, you just see through the ground,” he said. Cal Water customers are being alerted by door-hanger and bill insert that they’ll be getting a new water meter. The company also has information about the program on its website and a short video about how to read your water meter. But that hasn’t allayed everyone’s fears about ballooning bills. During the roughly three years her family had lived in the house, Hillcrest resident Alicia Urias said her flat-rate bill had gone up from around $60 a month to about $100. She was hopeful their cost would go down once their new meter was operational, but she remained apprehensive. “Yeah, you know, I’ve heard a lot of horror stories about bills coming in high,” Urias said, acknowledging the finality of her family’s situation. “Just like Pacific Gas & Electric, once you see that bill, you start cutting back real quick,” she said. Cal Water crews usually install meters on one side of a street, then the other, like on Elton Street, where they were working Friday. That could have meant Elton Street resident Donald Curry would have had a long wait, likely days before getting his own meter. But as he watched workers install Urias’ new water meter across the street, Curry said he’d had Cal Water install a meter on his property more than a decade ago when his flat-rate bill was still around $40 a month. Since then, Curry said his bill varies from around $20 in the winter, where it was last month, to nearly $50 in the summer. Click here to view a public notice regarding your drinking water. Californians reduced their water use by 29 percent in May compared to the same month two years ago, the biggest drop since the governor called on us to sacrifice due to the drought. 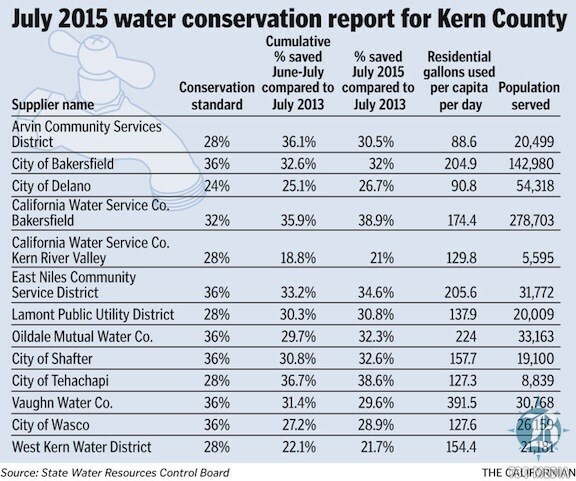 Many in Kern County did even better, including customers of Cal Water Bakersfield and Shafter at 37 percent, Arvin at 35 percent and even the Rosedale area at 30 percent, according to the State Water Resources Control Board. BAKERSFIELD, CA – It’s Tuesday evening, and only people with odd-numbered addresses should be watering. It’s Mason Burleson’s job to make his customers aware of the rules. Oildale is part of the county, but they’ve adopted the same rules as the City of Bakersfield. Rules like, people with an odd numbered address can only water on Tuesday, Thursday, and Saturday. People with an even numbered address can water on Sunday, Wednesday, and Friday. But as homes were checked off the list, no fines were given, yet. But if at some point people are continuously wasting water and breaking the rules, Burleson will have no choice but to write the fine.